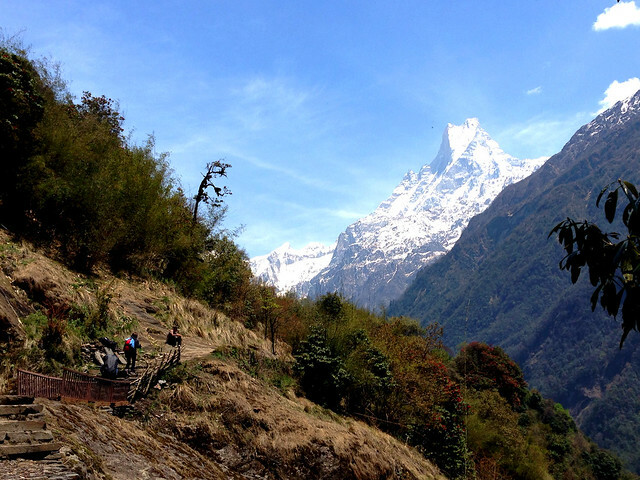 Getting closer to Annapurna Base Camp. Day 5 on the trail. 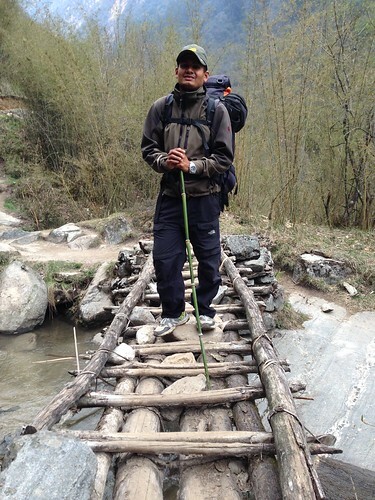 Madan, my guide, takes the lead as always. The goal was to trek for 6 hours from Chhommrong to Dovan (2,600 m / 8,528 ft above sea level) on Day Five. I ended up doing 8 hours of trekking that day. Instead of staying the night at Dovan, I was forced to press on further for 2 more hours and reach Himalaya at an altitude of 2,900 meters. It was a challenging day for me. I think what kinda bogged me down was having no choice but to hike further for a few more hours. Physical fatigue is one thing, but what really makes or breaks your trek is the level of mental readiness. Day 2 was just crummy most of the time, with those Ulleri steps. But I think I can safely say that on Days 5 & 6, I was quite the bipolar trekker--alternating between silent misery and excessive outward displays of cheerfulness. There were moments when the trail overwhelmed me and I would clam up, not talking to my companions. But I also wanted to dispel any negative attitude as much as I humanly could, and so I tried to compensate by maintaining a stream of chatter that lasted for minutes and minutes. Hari and Madan must have been so confused with me; I would look gloomy one moment and then switch to being ridiculously chipper in a Santa Claus ho-ho-ho kind of way. Hari waiting for me to cross this rickety little bridge. Call it an attempt at mental survival, if you will. When you've been hiking up the mountains for a few days already, one tends to get a bit cuckoo at some point. At 8:00 am, I said goodbye to Chhommrong. The unique part about this place is that it is a crossroads for people heading to Base Camp and back. You have no choice but to pass through Chhommrong. This isn't exactly good news when you're either leaving or returning to this place. 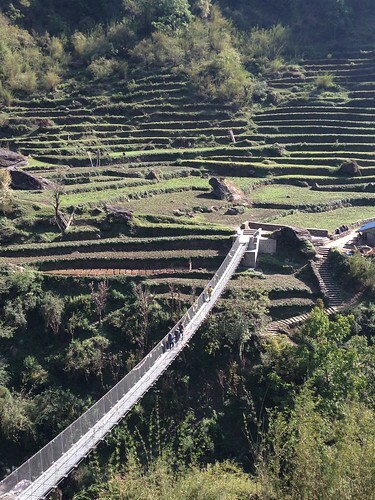 At the start of Day 5, I had to suffer through 30 straight minutes of cruising from the very high point of the Chhommrong settlement all the way down to a suspension bridge. The rough steps were too numerous to count. Anyway, as we swept past a whole gaggle of trekkers leisurely making their way down the steps, Hari said that we would be climbing up the same Chhommrong steps on the way back after reaching Base Camp. Good lord, I thought to myself and tried not to panic. By then, I had just walked past a trekker who was slowly climbing up the steps bare-footed. But I restrained myself from any kind of verbal diarrhea. I had no idea what she was attempting to do. She looked up and rested her palms for a moment on top of her trekking poles while catching her breath. I think she could read my mind as I stared down at her soon-to-be-sunburned feet. "Yeah, I'm okay. 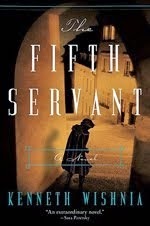 I'd rather walk barefoot for now," she explained in a tired, ragged voice. "The way up is so hard." Gulp. I wasn't looking forward to a potential Nightmare on the Ulleri Steps, Part 2. The descent continued until we found ourselves at the great suspension bridge. Hari explained to me that once we crossed the bridge, we would be doing a lot of ascents that day until we reach our destination. Couldn't really complain about the first few hours of going up; at least my knees could take a break from all those continuous downhills! Before our lunch at Bamboo (2,300 m), we had a quick toilet break at a teahouse in Sinuwa (2,340 m) with a pretty viewpoint. It was there that I learned that if I, as the trekking client, ordered a glass of cold lemon juice (only for Rs 50), my guide and porter would each be served their own cold lemon juice for free. I couldn't think of a better way to spend Rs 50 (US$ 0.50). And it was a nice little tradition to uphold here in the Himalayas. During lunch, Madan gave me the lowdown on today's destination. "I checked this morning from Chhommrong, and I found out the teahouses in Dovan are full," he warned. "If I can't get rooms for us in Dovan, we need to go on until we reach Himalaya. If there are no rooms in Himalaya, we go to Deurali." The last stretch of ascents from Sinuwa to Bamboo had tired me out, but at least my dal bhat lunch had managed to re-energize me. I wasn't worried about the 1-2 hour trek from Bamboo to Dovan; I knew already that Dovan was not an option anymore for an overnight stay because of the lack of rooms. 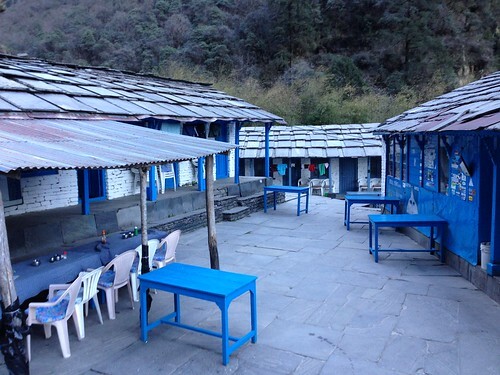 The fact that Dovan, a major stop in the trek, had only 3 teahouses (18 rooms in total) was completely ridiculous though. I wondered how the trail looked like during the busiest season of the year, which is October to November. Do people end up sleeping on the dining hall tables then? I then set my sights on Himalaya (2,900 m) and I needed to ensure that we got there on time to reserve rooms. I didn't relish the idea of being forced to press on to Deurali (3,200 m) which entailed an extra 2-hour trek from Himalaya. So for me, it was Himalaya or nothing. Deurali wasn't an option in my head. I HAD to get to Himalaya on time. Bed space competition was fierce here, since there were only had 2 lodges, or a total of 12 rooms. This was like being in the 19th-century Oklahoma Land Rush or something. As it was all ascent that afternoon through some dense forest-like areas, my energy was wearing thin by the hour. When we walked past the Dovan teahouses, I tried not to stare at the other trekkers who were lounging about, sipping tea or reading their books. I didn't want to get all green with envy. Madan decided that he would go way ahead to Himalaya to get rooms for us three. He would just meet us there, which I thought was a good strategy. So from 3 to 5pm, Hari and I trudged up the path to Himalaya, stopping once in a while to share and munch on the big bag of trail mix I brought with me. I was tired when I reached Himalaya. The rooms were indeed very limited, and I didn't have the luxury of getting my own room. So for the first time on a trek, I was asked to share a room (with 4 single beds inside it) with two Chinese individuals. Since I got there first, I was able to choose a nice bed by the window with a ledge for my stuff, some ample floor space for my rucksack, and wall hooks nearby for my trekking clothes. The two Chinese nationals--a boy and a girl--arrived around 30 minutes later. For a moment there, I thought they were a couple, but the girl had told me that they were just traveling as friends. At least I didn't have to undergo the awkward situation of sharing a room with a couple. As it got dark and the sun disappeared from view, a few more trekkers trickled in. I was grateful to have reached Himalaya on time; I couldn't imagine heading on to Deurali at night to negotiate for bed space. It was extremely cold in Himalaya. The gas shower was moderately hot but because it was freezing cold everywhere (even inside the shower), the hot water couldn't do much to keep me warm. I think there were only two female trekkers--a Thai and myself--who actually braved the shower. Can't speak for the Thai girl, but I can definitely say most Filipino women will find a way to take a bath regardless of climate conditions. Inside the dining hall, there was no stove, no heat, and everyone huddled together, wearing their down jackets and wool caps. Dinner was an intriguing spaghetti mix of onion, garlic, tuna and cheese, but as always, I barely touched my dish due to lack of appetite. Because the dining hall tables were laid out in a way that you end up talking to a lot of people around you, I made friends with the Thai girl, my fellow hygiene addict. She was actually trekking with her twin brother. I had seen them on the trail a couple of times, but it was only now that I was getting to know them. She said that she had initially wanted to do the Annapurna Base Camp trek alone. But her parents wouldn't allow her to go by herself, and so her twin offered to accompany her. And she revealed, with a giggle, that her brother was enjoying the trek more than she was. Lights out at 8:00 pm and I shivered underneath two thick layers of blankets. Today's trek wore me out but in retrospect, I figured that it was a million times better starting Base Camp Day from Himalaya than from Dovan. It meant less trekking hours on the most important day of the trek. With that comforting thought in mind, I fell asleep. As the day wore on, Machhapuchhre (Fish Tail Mountain) looked bigger and closer. 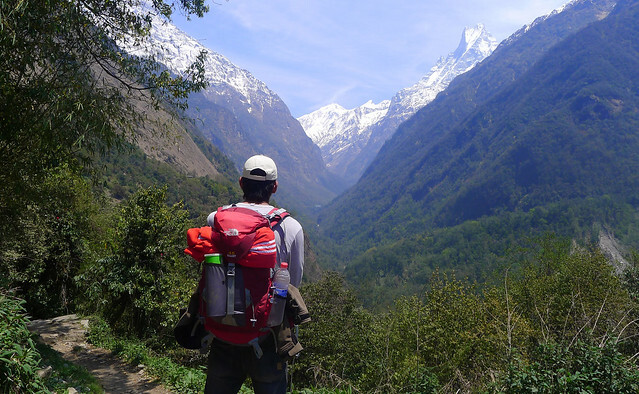 One day left to reach Annapurna Base Camp!